If you’re the type of person that goes a little stir crazy when it comes to running on a treadmill, then you’re probably inclined to head out the door, hit the open road, and enjoy the fresh air out on a run. However, are you paying attention to the surfaces that you’re running on? While running certainly isn’t everything when it comes to the overall fitness equation — this high-impact cardio activity isn’t cut out for everyone, after all — it is one of the single best ways to get in the much-needed cardio that’s required to support your overall fitness! Of course, cardiovascular fitness in and of itself is also only a part of the greater fitness equation. At Intelligent Fitness Personal Training, we take…well, an intelligent approach to human and health and optimal fitness. Acknowledging the fact that everyone’s path to fitness is unique and a personal, individual experience, our personal trainers in North Canton and Greentown create and design training plans that work with your unique physiology and fitness background. Truly, there’s no one-size-fits-all plan when it comes to health and fitness! No matter where you are in your fitness journey, or what your goals are, our personal trainers can help. Contact us today to get started! 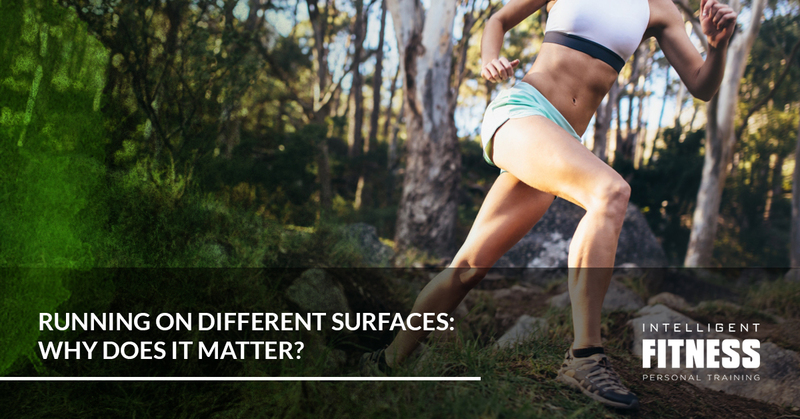 For our fellow runners out there, read below about why running on different surfaces matters. If you’re “pounding the pavement” on every single run and purely sticking to concrete or asphalt (road terrain), you’re going to be more prone to the notorious shin splints. Not good. Naturally, some people are more prone to shin splints than others, but if shin splints bother you, hard, unforgiving surfaces like the road aren’t going to do you any favors. Soft surfaces like trails/dirt paths, outdoor and indoor tracks, grass, and sand are significantly softer and more forgiving. However, these softer surfaces might not offer as much “rebound,” meaning that the energy returned to your body with each step as you lift off the ground continuously is more absorbed into the ground. Here’s a quick characterization of some of the most common surfaces that runners tend to hit. Through more likely to give runners that desired “spring” effect in their stride, these surfaces are, as our personal trainers mentioned above, harsh and unforgiving. If you struggle with weak joints, knees, or shin splints, avoid running on the road or sidewalk, or at least vary your terrain. Trail running is very popular with runners. Acting as a soft surface to absorb each foot strike, trails are a great alternative to pounding the pavement. However, keep in mind that standard road shoes won’t provide nearly as much grip on trails as dedicated trail shoes will give you. Additionally, trails are usually riddled with rocks, tree roots, and other inconsistencies that can leave you with a broken ankle if you’re not paying attention to what’s ahead of you. This isn’t a very popular surface for runners, as grass is more used for training purposes than recreational runs. Though extremely soft on impact, grass is very absorbent, meaning that it will require significantly more effort to lift each foot off the ground after it lands. Grass is like a resistance workout for runners. The rubbery, plastic-like surface of a treadmill belt is certainly softer than pavement, but nowhere near as soft as trails, grass, and sand. Treadmills do offer very good rebound energy, just like that of road surfaces. This is, arguably, the toughest surface to run on — and probably the least popular, too. Can you imagine why? Yes, it’s because your foot sinks into the ground with each step! Like grass, this is a resistance workout for runners…but with even more resistance. Contact Our Personal Training Gym In North Canton And Greentown To Learn More! We’re excited to help you navigate any fitness-related matters in your life. Reach out to Intelligent Fitness Personal Training today to get started! Learn More About Our Trainers Here!